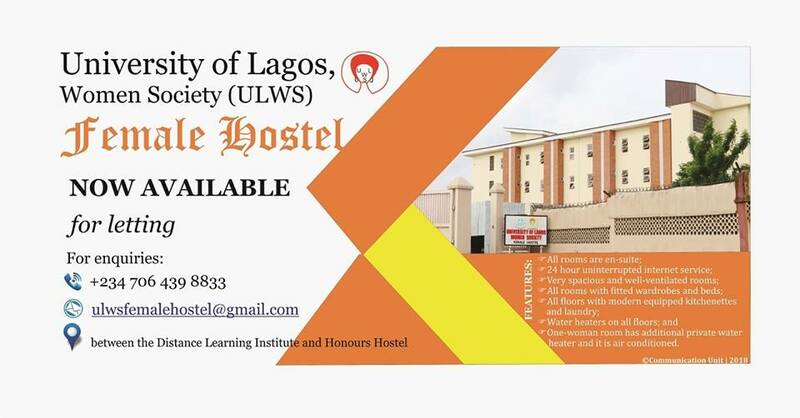 The University of Lagos Women Society (ULWS) Female Hostel, located between the Distance Learning Institute and Honours Hostel, is NOW AVAILABLE for letting. • One-woman room has additional private water heater and is air conditioned. 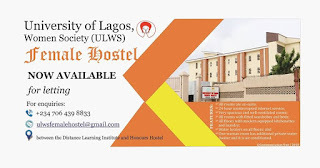 Accommodation at the ULWS Female Hostel, as the name depicts, is available only to female students (undergraduate, postgraduate, foundation and DLI) of the University of Lagos. Application forms are available at the Hostel premises or the Administrative Office of the ULWS Schools.